On this weekend the Italian Magpies will receive another visit by their English friends Andy and Lisa Black: they're travelling from Nottingham to Turin to celebrate the Juventus' Serie A title, the 31st scudetto! It's going to be another great weekend, of course in black and white. 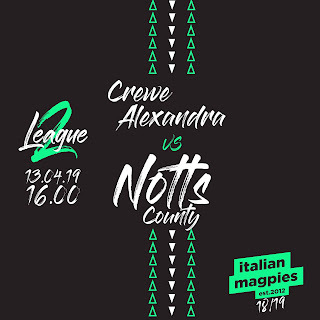 The game is on Saturday at 18 pm, italian hour, and the Magpies will be at the Stadium a couple of hours earlier to meet their italian friends. "We have had several meetings between Notts County and Juventus fans over the last two years, we have built great friendships. Last year when Juventus won their 30th scudetto I watched with envy the scenes from Turin of the team going through the City and my friends posting with excitement and happiness at yet another Juventus achievement. For me coming over for the final home match of the season and to see Juventus lift the Champions trophy is a very special thing. I will be with my Italian friends who share the same passion for black and white, football and of course friendship. Notts County will always be my first team but Juventus will always be in my heart, not just for the football, but because of the fantastic links I now have made with Italy and my very special friends, the Italian Magpies. Forza Juve and see you on Saturday!"